The exhibit brings under one roof the events, changes and upheavals Jerusalem underwent during the Second Temple period: beginning with the return of the Babylonian exiles to Jerusalem following King Cyrus’ proclamation (6th century BCE), through the adornment of a Hellenistic face under the reign of the feuding successors of Alexander the Great and up to the purification of the Temple by the Maccabees (164 BCE) and the reign of the Hasmoneans in Jerusalem which followed. In 538 BCE, the Babylonian kingdom fell in the hands of the Persians. Unlike the Babylonian kings’ custom of exiling the nations they had conquered and destroying their temples, King Cyrus adopted an opposite policy: in his famed proclamation, Cyrus allowed exiles to return to their countries and rebuild their temples. During the reign of Antiochus IV, Epiphanes, the Temple was desecrated and converted into a shrine for the Greek Gods. 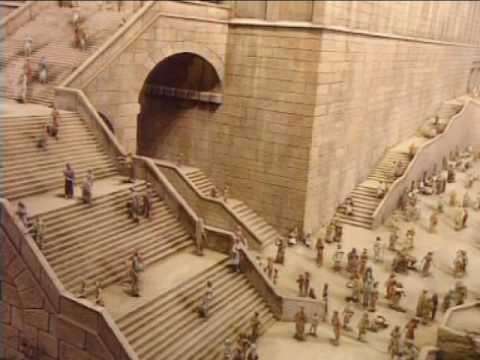 Soon after the outbreak of the Hasmonean Revolt, Judah Maccabee seized Temple Mount (164 BCE). Destruction of the statue of Zeus The Temple was purified, a new altar was installed and sacrifices which conform to the commands of the Torah were renewed. Herod glorified Jerusalem and built enormous Greco-Roman buildings, among which three towers are famed, Hippicus, Phasael and Miriamne. They protected the entrance to the city and particularly the King’s Palace. The crowning achievement of Herod’s building project was expanding the Temple Mount esplanade and turning the Temple into a glorious site. The Temple became an object of desire for hundreds of thousands of pilgrims from within the country as well as abroad. After King Herod’s death (4 BCE), the country became a Roman province. Hostility between the Jews and Romans grew under the rule of the procurators and eventually led to the Great Jewish Revolt. Titus, son of Emperor Vespasian, laid siege on Jerusalem (70 CE). Battles for the city raged for five months before it fell in the hands of the Romans. The Temple was set on fire and Jerusalem lay in ruins.